Confiscated in February 2004 and released in Jambi in October of the same year, Leuser survived happily in the wild in Jambi for two years. Unfortunately, in late 2006 he wandered near a village at the forest edge and was shot 62 times with an air rifle, including pellets in both eyes, rendering him totally blind. He was returned to the quarantine centre near Medan in November 2006 for medical care. Only 14 of the 62 pellets could be safely removed from his body. Leuser appears to have made a full recovery from his injuries although we can’t be certain what the long-term effects will be. 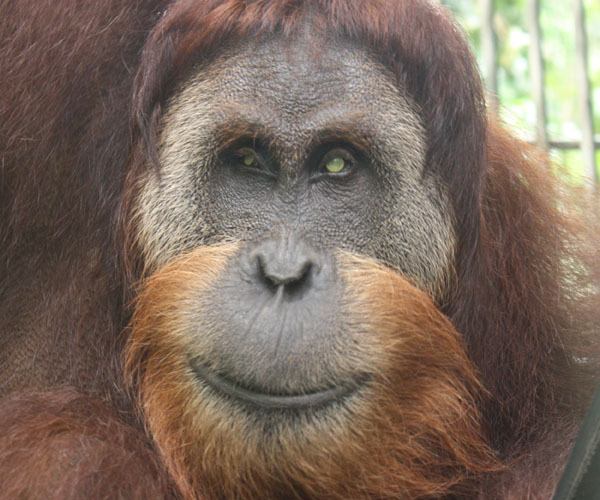 He was introduced to another blind orangutan, the female Gober, during 2010 for companionship. Gober got pregnant and produced healthy twins in February 2011. Since the pregnancy the father, Leuser, has been housed separately. We plan to reintroduce the family, very carefully, in 2012. Leuser is estimated to be around fourteen years old and is maturing into a large male. He currently weighs approx. 65 kg and should eventually reach around 100 kg. Apart from blindness, he appears totally fit and well, has a good appetite, and behaves exactly like a normal orangutan of his size. Leusur is developing to become a very handsome male orangutan. As he develops, so does his strength! Keepers have gone out of their way to really make sure he is mentally stimulated whilst in his cage. Every night the keepers give Leuser a lot of leaf material, so he can build a comfortable nest. Leuser loves building nests and is very good at it! Leuser is still lonely. He looks towards the keeper s for attention. He loves his head being scratched and his fur being groomed by the staff. He makes small pleasure grumbles and will often move to indicate what area he wants groomed. When it comes to food time, he is very inpatient. He will often 'kiss squeak' and inform the keepers to hurry up and feed him! The keepers always priorities Leuser for food first, otherwise he will get upset waiting to long! Leuser has no favorite food, but will be fed 6 x per day. Usually orangutans will feed frequently and sleep. At SOCP the team aims to do this with all the orangutans. Leuser finds it hard to see so when the keepers feed him, special care is taken to ensure he takes all the food and does not leave any behind. Leuser will be undergoing some new training plans in the next few months to get him moving and stimulated. He will need to be able to problem solve and aim to move around a lot more independently when he goes onto his new island home. This will take a very strong bond between the keepers and Leuser so he can build trust and confidence.